I lived almost continuously at 11 Chesley Gdns - the house with the Union flag - from when I was born in 1933 until I came to Bristol in 1966. May 1945. Chesley Gardens, London E6. 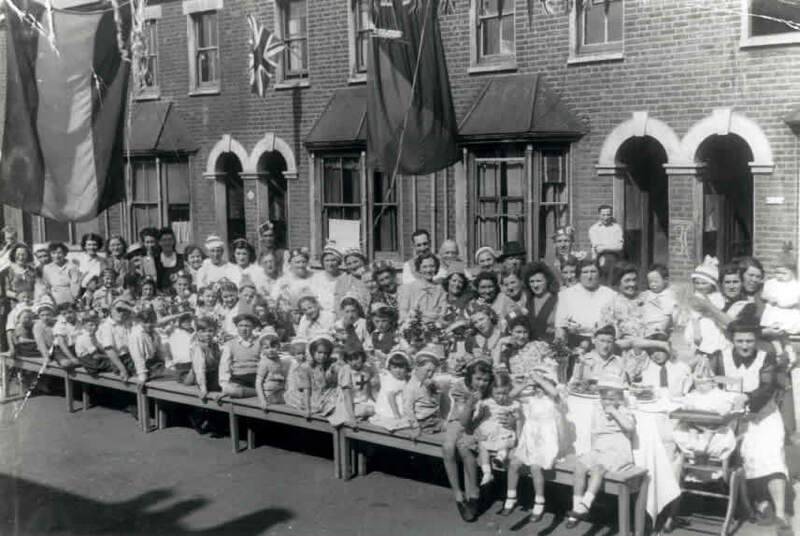 Street party to celebrate VE Day. The Union flag is on number 11. The man, first on the right in the back row in the white sailor's type hat, is Dering Briggs, owner of number 11. 5 people to his right is a woman wearing an apron. She is Mrs Hancock from number 9. Immediately below her, wearing a party hat, is Jim Briggs, son of Dering. Jim's mother is not to be seen - she was probably preparing the food! 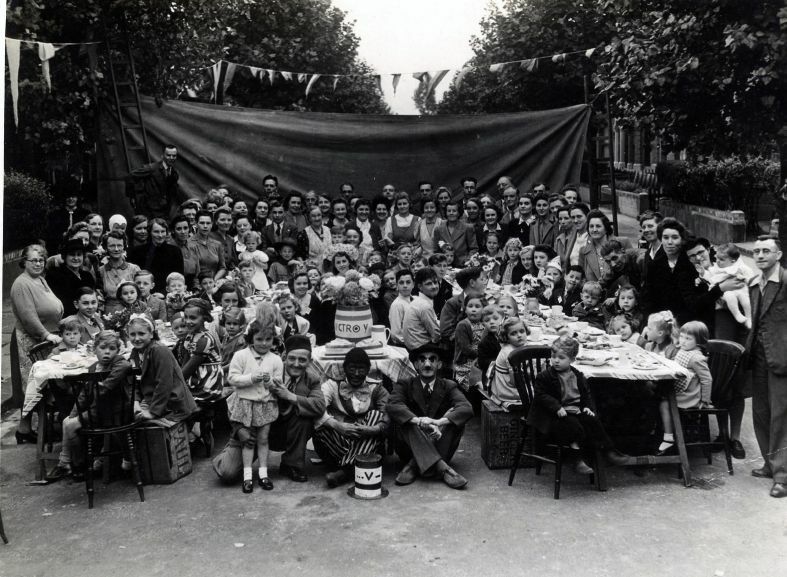 Daphne Smith, nee Dimples, sent the above picture from Australia of the VE street party in Frinton Road, E6. 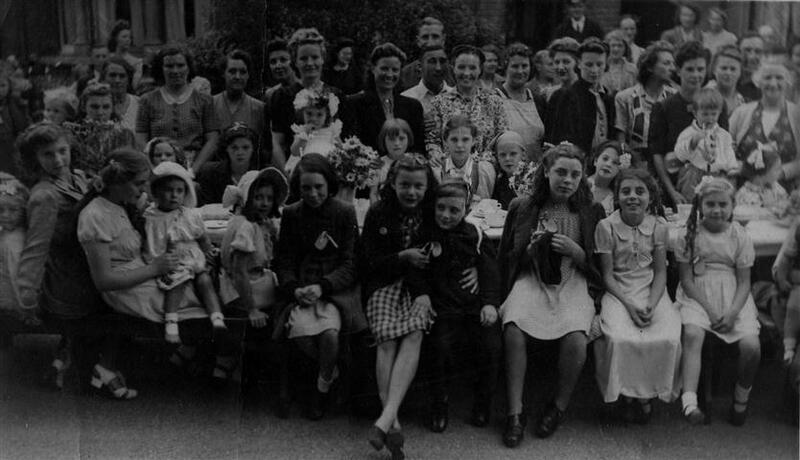 She said: "I am the little girl seated 5th on the right hand side of the left hand table (there is a boy sitting on a chair at the top of the table). My mum is the11th person on left from front. She is next to a short lady with glasses. Our house (no. 80) was to the right of the photo and further to the front". John Benning, from Australia, sent scans of two VJ victory party photos. He said: "Quality is not good, I fear. Both pictures are slightly out of focus. The houses in the background would be numbers 58 and 56 Hall Road. We lived at number 50, to the right of the pictures. I managed to appear in both groups, along with most of the children. In photo 1 I am seated on the kerb 5 in from the right, my kid sister in front of me. Next to me with the funny hat is my girl friend Mavis Blake, with her kid sister in front of her. In photo 2 I am second from the right in the central group of four boys." Baxter Road, Custom House street party. May 1945. Source Newham Archive. Brian Laitt, EHGS 1951-1957, sent the following picture. 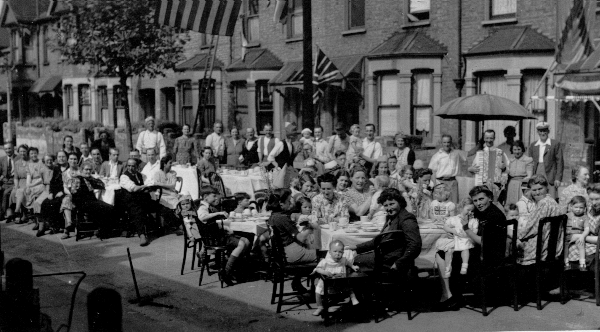 It is of the VJ day street party held in Landseer Avenue, E.12. He is the five year old dressed in a warden's suit in the front row/centre. His sister, eight years his senior (and now deceased) is seated to his left. 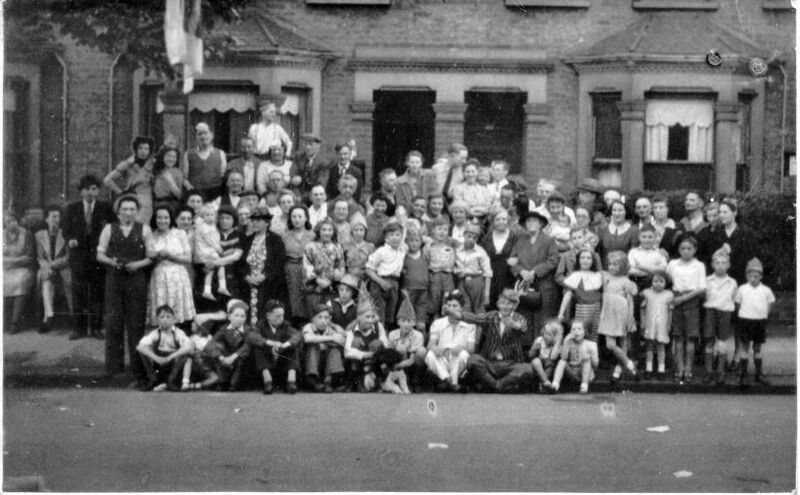 There are several in the photo who went on to become boy or girl Esthameians.